The 20th Annual Tomato Day will be held at the Sedgwick County Extension Education Center at 21st and Ridge in Wichita on Saturday July 25th from 7:00 a.m. – 12:00 p.m. 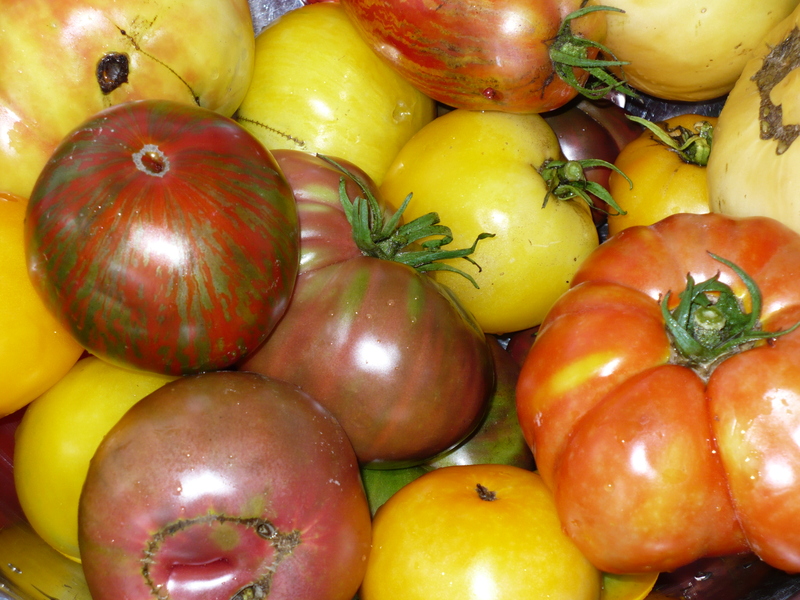 This event will provide information on selecting, planting, maintaining, cooking with tomatoes. Admission is free. Gardeners, bring your home grown tomatoes and enter them in the Ugliest, Largest, Best Plate of Roma, Cherry, Grape or Tomatillo contest. The cooks in the family can enter Fresh or Preserved Salsa or Other Preserved Tomato Product. All preserved products must meet USDA approved processing methods; this information is available at the Extension Office. New this year is the Topsy-Turvy Tomato contest sponsored by KWCH 12. The Tomato Photography contest returns with categories of Mr. Tomato Head, The Artistic Tomato and All Natural Tomato. Prizes will be given in all contests and categories. 4-H Hall: Fried Green Tomato & Salsa Tasting, Youth Activity making Tomato Critters, Plant Diagnostic Lab, Garden Magazine Sale, Tomato & Salsa Contests with prizes, Iris Rhizomes for sale by the Wichita Iris Society, Brunch provided by La Familia Senior Community Center. Kansas Grown! Farmer’s Market will be in the parking lot and Plant A Row for the Hungry will be collecting garden produce for the Kansas Food Bank. Posted on July 15, 2009, in Upcoming Events and tagged summer garden, Tomatoes, Vegetable gardening class, Wichita garden classes. Bookmark the permalink. 2 Comments. This year, it needs another new category: saddest tomato story. Here’s my entry: the Delano hailstorm wiped out all my JetStars except the runt that was still in a pot on the shaded porch because I didn’t have room to plant it. So now that I had PLENTY of room, I planted it, along with a couple more Romas. They’re the size of early-June transplants, not mid-July, but it’s better than nothing, right? Then, because it was crazy hot and I was too busy dealing with roofers and insurance companies and siding guys to put a sunshade on them, they got a bit sunburned. But it looked like they’d recover, and even got brave and put out some blossoms. Today I checked on them and the JetStar’s blossoms and last healthy leaves were gone. Every single one of them. The plant is stripped down to the stems. In their place? A fat, happy tomato hornworm. hi Karen in Wichita, I’m to the West of you about 1/2 mile or so. The hail didn’t get my tomato plants because Squirrels already had. I blamed the neighbor kids, then we set up a field camera on a tree. Well we didn’t have to wait for a picture as we saw ‘him’ in the topsy turvy going to town, ate all the leaves off in no time. They ate every single tomato off 6 plants I had this year. What makes it worse is I feed those squirrels good expensive bird food. (well I did) I have 4 small tomatoes again so my bird feeders are empty, my pretty song birds are gone just so I can keep those fat happy squirrels away.